The countdown has begun for the release of AMARANTHE‘s fifth album “Helix”. 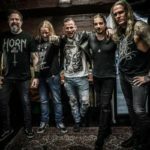 The follow up to 2016’s “Maximalism“ has been recorded in Dermark with producer Jacob Hansen, and is finally coming out on October 19 via Spinefarm Records. A new music video “Countdown” has been released and you can watch it below. Once again, the video was directed by Patric Ullaeus of Revolver Film Company. With its electrifying fifth album “Helix” due out October 19 through Spinefarm Records and armed with new singer Nils Molin, AMARANTHE takes another leap forward in its sonic evolution. “Helix” proves the band has refined its melodic sensibilities ever further while retaining a cutting-edge metal assault. The band is as massively aggressive as ever and the first single “365” is the perfect example of such — its seductively velvety mix of contemporary pop and modern metal will take up residence in your brain for days. AMARANTHE have also announced that they are now managed by former ARCH ENEMY vocalist Angela Gossow.